The VacPan is a new Central Vacuum outlet that is easily installed using standard fittings and pipe, in both new and existing systems. High traffic areas like kitchens and bathrooms are a great place to use the Vac Pan! 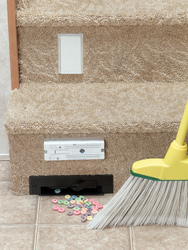 It's as easy as sweeping dirt under the rug - simply sweep dirt over to the Vac Pan inlet and it's gone! A slight touch of the foot to the On/Off kick switch activates the unit and eliminates bending over. The flush-mount design installs easily in a stair, baseboard or cainet. Note: This item requires a central vacuum system which is not included.